Parents exploring education options for their children may wonder how a charter school is different from a public school. With the wide variety of options available in most areas, some confusion is quite understandable. However, in this article, we’ll explore the similarities to and differences from a traditional public school, as well as touch upon the unique learning opportunities that a charter school has to offer your child. Charter schools are, by definition, a part of the public education system. However, there are some key differences between these institutions and those that function within the ordinary parameters of the federal, standardized system of schools. Quite simply defined, they operate on a contract basis with the federal government—hence, the charter. This document establishes specialization, focus, pedagogy, and also provides for how they will measure the academic success of their students. Parents who are interested in placing their child in one of these establishments would do well to review any respective contracts as well as the institution’s record for academic excellence. Doing so will allow them to select the proper charter school for their child’s specific academic focus and intellectual aptitude, according to the Center for Public Education. Yes, a Charter School is a public school. They have no specialized entry exams, additional fees for attendance, or other requirements not typically outlined by public schools. They were created in the early 90s as a way to offer parents more educational options and as a testing ground for different pedagogical approaches. Hence, performance and institutional success may vary significantly from school to school. They were also instituted to allow for more freedom of experimentation in what teaching approaches work best. Teachers are not bound by the same, rigid and unimaginative standards that apply to the federal board of public schooling. They do have high standards in many cases, and many of the same rules still apply, but they are permitted to try different pedagogical approaches to inculcate their students. Isn’t allowing them so much freedom a bit of a risk? In some ways, yes. However, the argument can easily be made that binding the learning process firmly to testable numbers and statistics hasn’t done anyone—teacher or student—any great favors. Yes, teaching to the test has allowed a more standardized appraisal to be made, with quantifiable results. But is learning actually happening? The original creators of the charter approach thought not. Charter schools were created because concerned educators noticed a distressing trend in the progress of classroom education on the public front. But their very freedom of teaching approach and criteria for gauging student success render them vulnerable. Because they are all about being a non-standard public education option, standardized appraisals of their performance are not beneficial. They do not provide an accurate picture of their strengths and weaknesses. Which educational option will be best for your child? When you are evaluating institutions, several criteria should come into play. First, what is the track record of the particular institution? 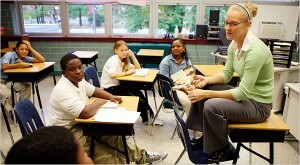 In some areas, a charter school may provide an exemplary level of instruction and development. In others, the public school system may offer a better option. Does your child exhibit specific learning needs, aptitudes, and behaviors? If so, a specialized charter school may be an ideal option. And of course, personal values and needs should be taken into account. Charter schools often focus on active learning, rather than rote memorization of materials. This is perhaps the most important way in which a charter school is different from a public school.